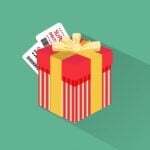 Today, we describe the Magento extension that is especially useful for online stores selling clothes, footwear, and other products of different sizes. Meet the Amasty Size Chart for Magento 2! 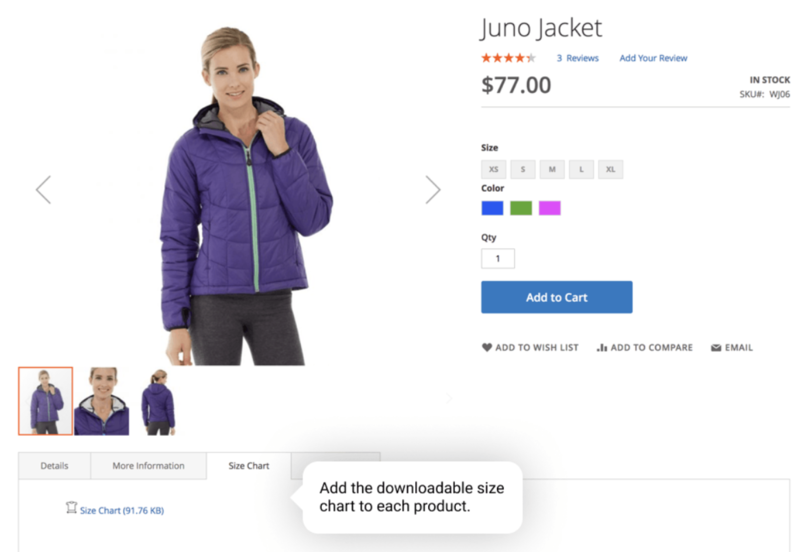 The module improves customer experience by allowing online shoppers to use size charts available for a specific product. 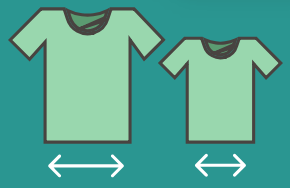 By adding size guides to your products, you decrease the number of inquiries in regards to products’ size measurement from customers and increase your conversion rates. Since multiple size scales are used in different countries, as well as sizes may vary depending on a brand, providing guides to help clients understand which size will fit them better is a win-win strategy. First, we will take a look at the key features of the Magento 2 Size Chart module and then proceed to its backend configuration. The Size Chart module provides you with the ability to place a size guide in the most suitable position on the product pages. Besides, customers can open a size chart in a separate window in a browser or download the file with one click of a button. The extension offers two options for attaching the files: to specific products or all products in one category. Note that the Magento 2 size guides extension supports all product types, so you can utilize it to convert sizes of clothing, shoes, jewelry, and other products. Besides, you can set the visibility of a size chart for a specific customer group, as well as attach different size scaling files depending on a store view. Thus, for example, your customers from EU will be able to understand their size if they buy a product of a US brand. The module supports multiple file types, including pdf, jpg, txt, zip, and more, so you can easily create eye-catching and vivid size guides to help customers quickly understand which size will fit better. Also, you can add image thumbnails to your files to make them look even more attractive. 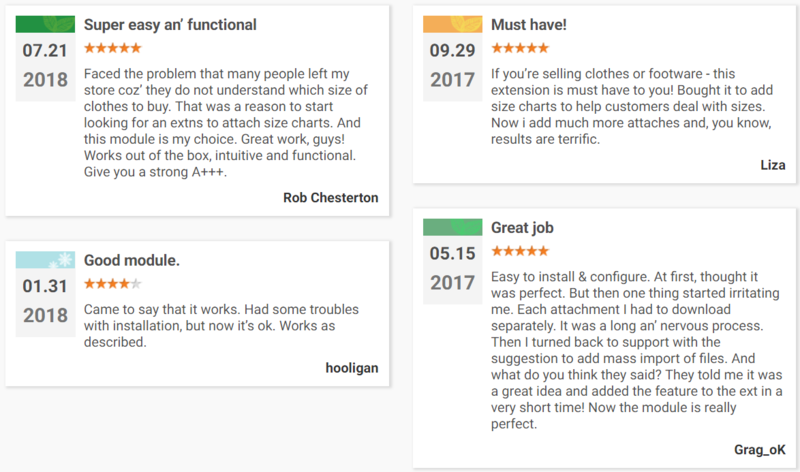 As we have mentioned above, the Magento 2 Size Chart extension enables users to attach a downloadable size chart to all products in the category or to each product separately. To add files to the whole category, go to Catalog → Inventory → Categories and select the necessary category. At the bottom of the page, expand the Product Attachments tab and click the Add New File button. 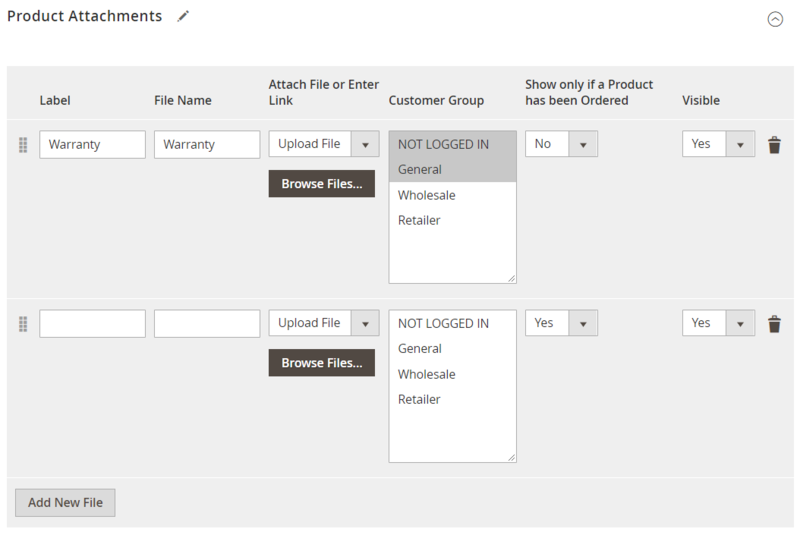 Here you can specify your file’s label and name, select customer groups for which it will be available, enable its display in case a product is ordered only, and make it visible. Besides, it is possible to enter an URL link instead of uploading a file. Note that you can attach multiple documents within a category. 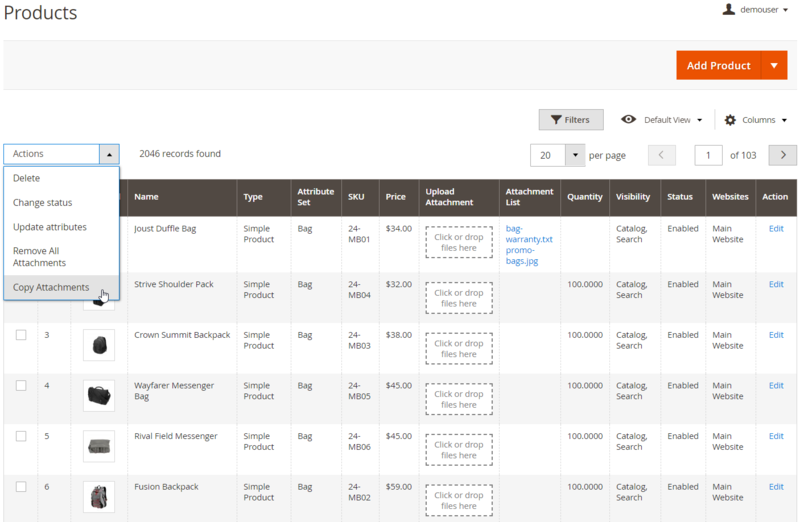 As for attachments for specific products, you can configure your options from Catalog → Inventory → Products. 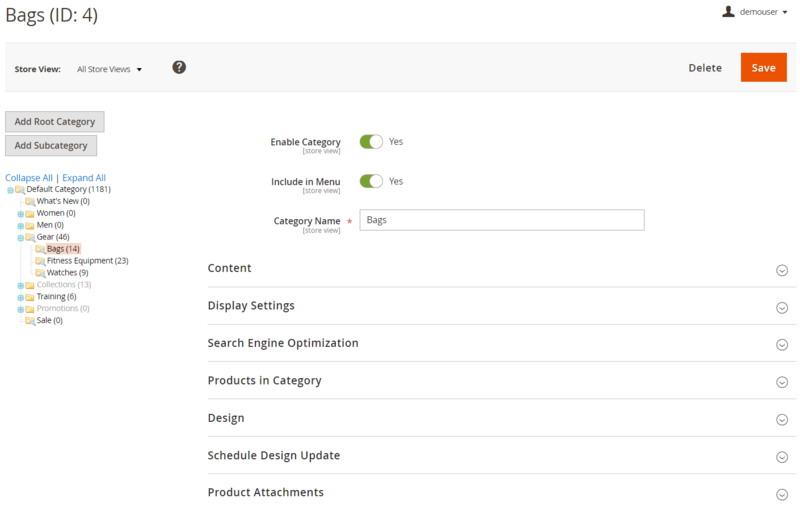 In the grid, select a product to which you want to add a file and scroll down to the Product Attachments tab to upload a necessary file. This page offers the same settings as the Category page. It is also possible to add attachments right on the Products grid. 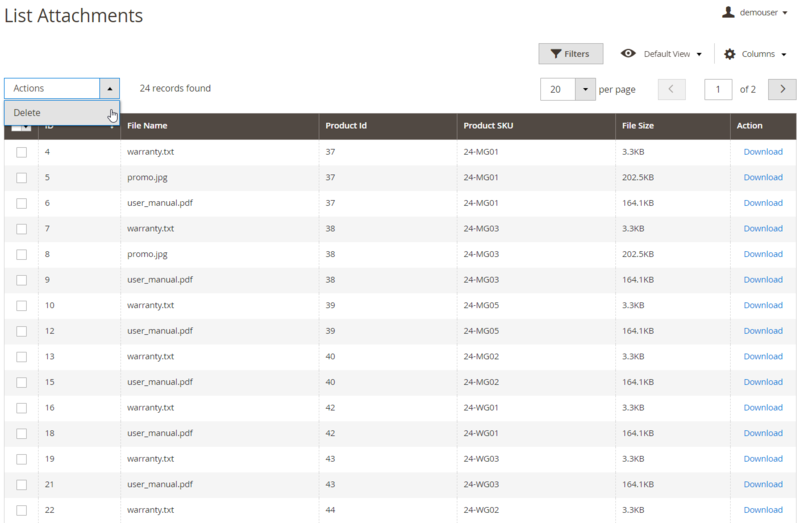 The Magento 2 size charts module adds a new ‘Upload Attachment’ column to the grid. You can click on the dedicated area in the column or use drag and drop function to attach a file to a product. Note that the module adds two new actions to the list of mass actions – Remove All Attachments and Copy Attachments. You can view all your attachments and their details in the List Attachments grid under Catalog → Product Attachments → List Attachments. It is also possible to download attached files here, as well as delete them in bulk. Under Catalog -> Product Attachments -> Icon Management, you can create image thumbnails for your attachments. When adding a new icon, you should upload an image, specify a file type, and enable or disable its display. Another function provided by the Amasty Size Chart extension is mass file import. Under the Import Csv tab, you can read the requirements to a CSV file that can be uploaded. The uploaded files will be displayed in the next tab. In the Upload Files tab, you can add a size chart attachment using FTP. 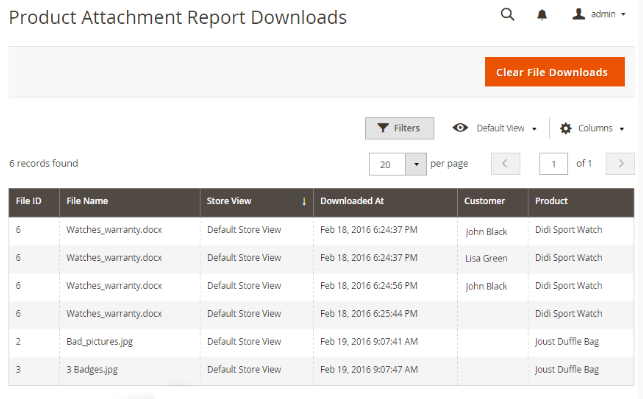 To view the stats on the attachment downloads, navigate to Reports → Product Attachments → Downloads. Here you can see a file ID and name, store view, time and date of download, a customer’s name who downloaded the file, and product. The Magento 2 size charts extension’s main settings are available under Stores -> Settings -> Configuration -> Amasty Extensions -> Product Attachments. 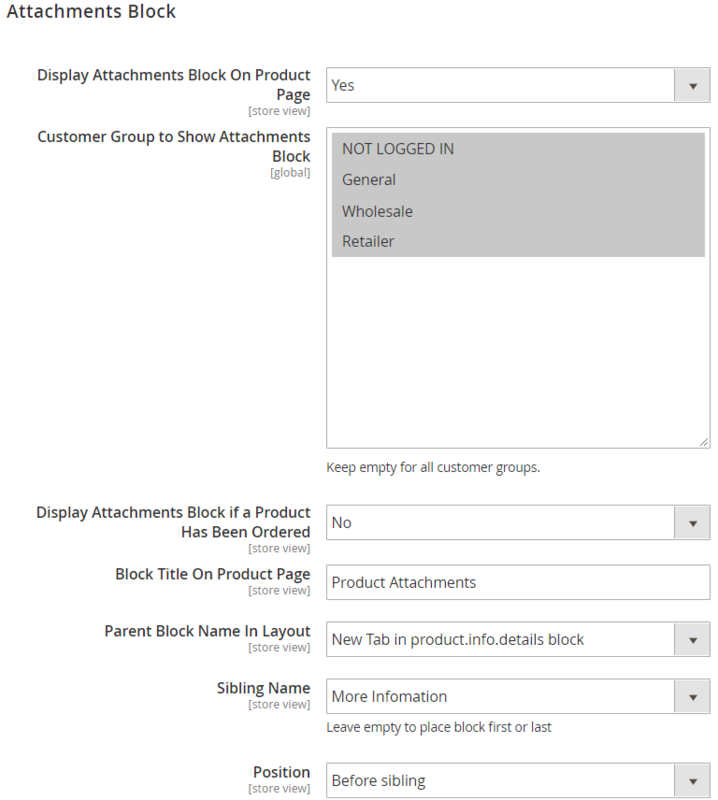 Here you enable or disable the attachments display on the product pages both on the storefront and in the backend, choose customer groups that can see the attachments block, and decide whether to display the block only if a product has been ordered. Then, you can create a custom name for the block on a product page and select where attachments should be displayed – in a new tab or within a layout block (Parent Block Name in Layout). Here you can also choose a position of the block on a page (Sibling Name and Position settings). In the Import Settings section, you specify a directory for uploading attachments via FTP. In the last tab of the configuration settings, you can enable opening attachments in a new browser window instead of downloading. Magento 2 Size Chart by Amasty offers excellent options to provide your customers with size converting functionality. 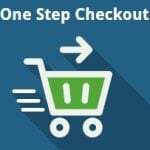 This way, customers can find the exact product they need, which increases sales and conversion on a web store. The module offers flexible settings for placing size charts on a storefront so that you can adjust their display to suit perfectly in your Magento theme.